Well who would have thought, the one and only iconic French skincare brand L’Occitane turns 40 this August! The Lavender Foaming Bath (£20.00 for 500ml) is formulated to leave the skin clean and supple. It contains lavender essential oil from Haute-Provence which has calming and soothing properties, and its subtle and unique scent delicately perfumes the water. You only need a small amount of product to create a bath full of bubbles and to sweep away the cares of the day. The scent leaves the mind and body relaxed, and skin supple and smooth. The limited edition packaging features a new design, inspired by fields of lavender seen from the sky, which trace diagonal lines across the plateaus of Haute-Provence, filling them with colour. The Lavender Rough Cut Soaps (£10.00 for 2x 100g) are again enriched with lavender essential oil from Haute-Provence. These soaps are inspired by authentic handcrafted soaps, and they gently cleanse the hands and body, leaving behind a delicate scent. There are also Verbena Rough Cut Soaps (£10.00 for 2x 100g) which contain an extract of organic verbena from Provence, giving a fresh citrus fragrance. 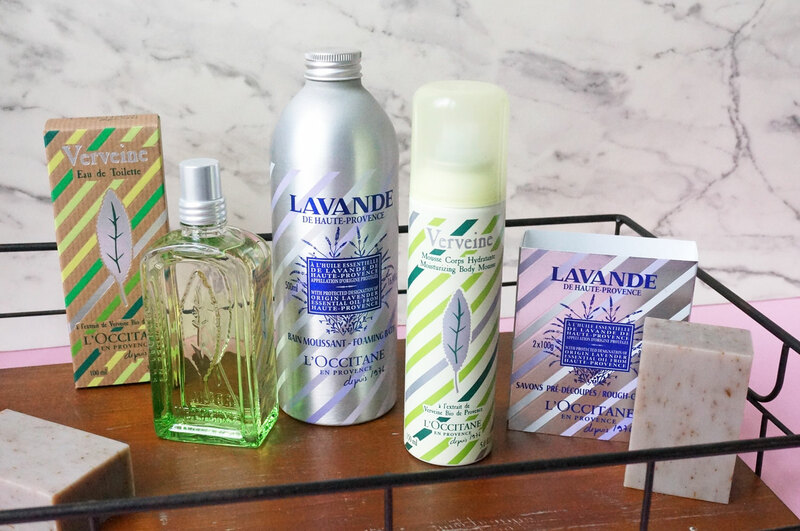 The 40th Anniversary limited edition products are available now at L’Occitane. Previous Post Happy 10th Birthday Soap & Glory!